MSD Ignition is the ignition of choice of the top professional drivers in NHRA, IHRA, NASCAR, World of Outlaws, DIRT, SCORE, IDBA and many more. MSD Ignition develops, tests and manufactures products including Ignition Controls, Coils, Timing Accessories and Spark Plug Wires and Accessories. MSD, housed in three buildings includes four engine dynos, two chassis dynos, complete CNC and machining centers, modern shipping and packaging areas plus assembly and burn-in departments. MSD Ignition products are the finest ignition components you can install on your car whether it's a daily driver, dirt tracker, 4-wheel drive, a seven second Pro Stock car or Big Foot. MSD is your exclusive performance ignition company. This section addresses ignition controls for performance drivers, bracket racers, 4x4's and everything in between. For engines that require incredible spark power to ignite exotic fuel combinations under high compression circumstances. Pro modifieds, pro stock, monster trucks, and pulling tractors will find their ignitions here. Like the multiple spark, CD ignition, MSD was the first to introduce a distributor housing machined from a billet of aluminum. MSD uses state-of-the-art Computerized Numerical Controlled (CNC) mills and lathes to create each housing. This procedure produces a flawless, lightweight distributor housing that is accurate to within 0.001". The complete line of MSD Distributors uses a polished steel shaft that receives a QPQ, or Tuftride coating. bushing controls the shaft. This combination keeps the shaft spinning smooth and accurately throughout 10,000+ rpm. All of the MSD Distributors (except crank trigger models) use a high output magnetic pickup to trigger the ignition system . One of the most important features of the MSD Distributors is the adjustable mechanical advance assembly. the advance plate is stamped and machined from chrome moly . Weight pins are then staked in and tig welded in place. the weights to ensure smooth movement as the weights are pushed out from centrifugal force to advance the timing. and stop bushings are supplied with each distributor giving you the ability to set up to 24 different curves. MSD offers distributors that have been approved by CARB for use in all the states. Each distributor features a vacuum advance for street economy. MSD Timing Controls are designed so engines with locked out timing or crank triggers can take advantage of an ignition curve. The weights and springs inside your existing distributor are removed and the mechanical advance is locked out so the timing is controlled entirely by the MSD Timing Control. By controlling the ignition electronically, the timing curves can be set faster, more accurately, and with more adjustability than mechanical advances. The Timing Controls provide reliable operation throughout the RPM range, and must be used with an MSD 6, SCI, 7, 8 or 10 Series Ignition Control. The performance of your race car's ignition relies on the charging system. Since these systems go hand-in-hand, it was only time before MSD designed and offered a high output alternator. Our new line of Advanced Power System™ Alternators will be available just in time for the 2004 racing and cruising season! Don't let the billet housing fool you as there's much more beneath this great looking housing. MSD engineers have spent thousands of hours testing different internal components, materials and windings. A special rectifier with 50 amp diodes improves control and reliability while a new surface mount regulator isolates and protects from high voltage spikes. Even the bearings were hand picked to withstand heavy axial loads and high rpm. Not only does the precision machined housing provide cool looks and great strength, but it also delivers a new universal mounting design called Slide-Loc. This technology allows one unit to be mounted to a variety of engines by selecting a bracket kit. (For speedshops, this feature means that you only need to stock one alternator!) The bracket installation kits are available separately for a growing number of different applications. Two models will be available in three outputs; a 105 amp, 130 amp and 160 amp version in either a direct plug-in installation or a one wire model. Most crank triggers have a wheel, with steel studs sticking out, bolted to the harmonic balancer. As the crankshaft turns the studs pass by a stationary magnetic pickup, triggering the ignition. This pickup can be triggered by other bolts, debris or even vibrations which will cause a loss of power or engine damage. The MSD Flying Magnet Crank Trigger uses four magnets secured in the aluminum trigger wheel that pass by a stationary non-magnetic pickup to trigger the ignition. This "flying magnet" design produces accurate trigger signals and the non-magnetic pickup cannot be false triggered. Each Flying Magnet Crank Trigger includes a two-piece mounting bracket for the non-magnetic pickup that in most cases will work on either the passenger side or driver's side of the engine (the SB Chrysler and SB Ford brackets mount on only one side). The CNC-machined aluminum bracket securely holds the pickup in place and is slotted to provide a wide range of timing adjustment. Spacers are included so you can mount the bracket on engines with standard motor mounts or engines with a ¼" motor plate. These systems will trigger MSD 6, 7, 8 and 10 Series Ignitions and all MSD Timing Accessories. The new DashHawk is an amazingly compact intelligent device that will provide you with real-time information about your vehicle's operation, diagnostic trouble codes, vehicle performance, and other useful information. User programmable alerts keep a watchful eye on critical items, while you can use the various data to alter your driving habits for maximum economy, maximum performance or for various tuning functions. Not much bigger than a credit card and installs with no tools in seconds! Easy to move between vehicles in minutes! 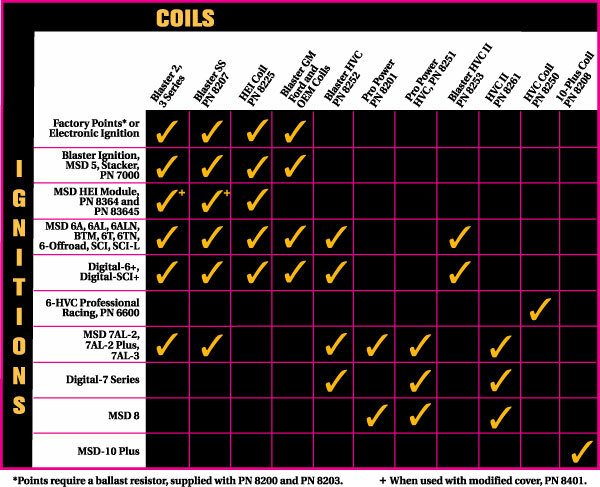 MSD Ignition offers a variety of ignition specific tools to help you install and diagnose your ignition system. Everything from distributor set-up tools to ignition testers and timing lights, MSD has the right tools to do the job right.